By Mike Ryan, May 19, 2008 in Plugins - Publishing ONLY! Alias is a simple plugin that appears in your Object submenu. It is designed to destroy antialiasing before running the amazing plugin, Feather. To use, simply run the effect. Adjust the strength accordingly! Yes! Thanks so much! I always wanted something like this! Glad to hear you both have found a use for this plugin! You know, you can kinda do the same thing with the Transparency plugin. But your's is more flexible and made for this task. The effect can also be partially accomplished using Outline Object, as pointed out by David. But like you said: this plugin is meant to get the job done, and it does just that. Yes, you can sit there and fiddle with Curves+ just like how Outline Object can disintegrate aliasing and Transparency. But this does it without problems or 'fiddling'. I have a suggestion: If feather is installed a checkbox is also visible on the dialog box which, when checked, runs feather along with this effect. My plugin is limited to Code Lab so I would have no reasonable way of checking for Feather, yet I can always create a check box to run Feather on default settings. Perhaps BoltBait should include the functionality of my plugin in his plugin? Other than that, any other feature suggestions? Love it. I've always needed something like this. There's not much more dismaying then running the feather plugin over AA. You can also do this with my Transparency Adjustment plugin... But, this seems more convenient since it is in the same menu. Thanks so much. Been looking for this kinda thing. This is also very useful for Basic Antialias (my antialiasing effect of choice, no offense BoltBait), because it doesn't work with any transparent pixels at the edges. Thanks Mike. this is my opinion, how about the initial value for 255? There is the case that need alias such as the MS Paint. The beginner cannot manage a curve. Kids seem not to be able to use the select tool well, too. I think that this is very good plugin. I must be doing something wrong. I downloaded Alias & have tried to use it to smooth the rougher edges of my image but it isn't doing anything. ??? Am I supposed to add a new layer or what? It operates on groups of pixels (objects) with an edge that borders a transparent area. The Object needs to be on a layer which is otherwise transparent. BTW: Alias does not smooth edges. Quite the opposite. 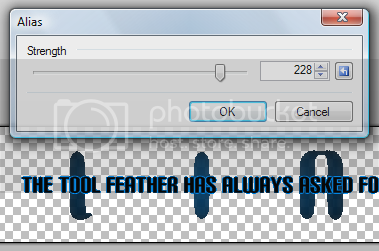 It removes smoothing (antialiasing) so you can reapply it with another plugin (like Feather). Think of it like this: you have a circle on a transparent layer. If you blur the circle, it will get a fuzzy edge. Alias removes this fuzzyness restoring (almost) the original pixelated edge.